Posted June 12, 2018 by Waarith Abrahams & filed under CSAG blog, Frontpage. This is a blog about my experience coordinating, engaging with students and participating in activities for the EGS4038F Course Field Trip. The field trip took place over the weekend of the 12th and 13th of May 2018. Coordinating this event facilitated introductions to the students and provided me with the opportunity to work more closely with staff. It was surprising at first to see how small the class was (10 students, of which only six were locals) but, satisfying to see some diversity and delightful to be able to add to that diversity. The class consisted of a mix of local and international students who majored in the social sciences and biophysical sciences. This allowed for integrating social dimensions into the data collection process in terms of effectively incorporating the biophysical and social interface component into the fieldwork. The fieldwork was conducted in a farming area in and around our accommodation, Mount Grace Lodge. 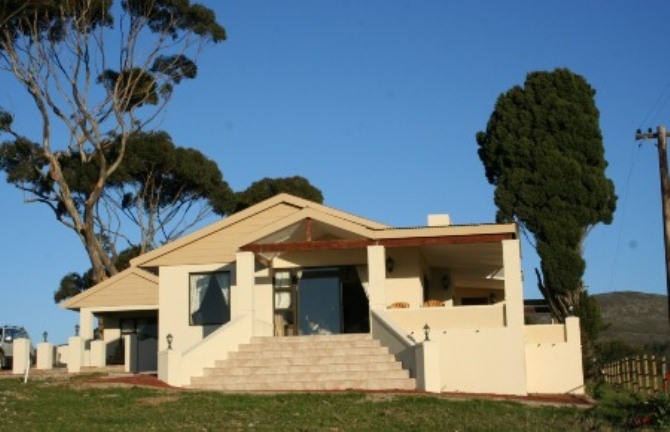 Situated in the mountains between Stanford and Gansbaai the family farm was converted to a game and cattle farm. 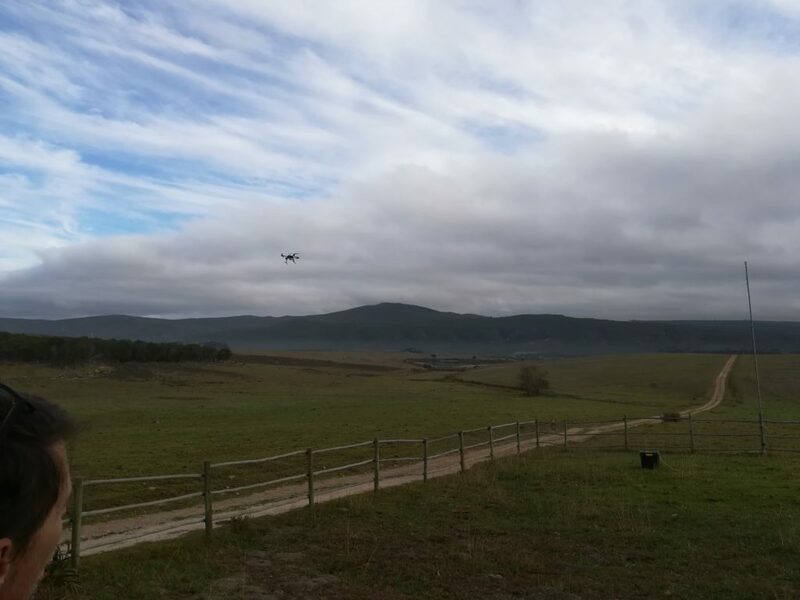 Cows, sheep and springbok were a common sight in the vastness of land outlined by mountainous landscapes. The beauty lies in the tranquility and serenity, the sounds of nature and the freshness of the air, away from the hustle and bustle of city life. We were fortunate to have good weather. It was cold, particularly at night but during the day it was pleasant and the wind was minimal with no rain during our time there. This made it so much easier to collect data without the risk of getting sick or stuck with wet/soggy clothing. Part of the experience was meeting new people, learning and gaining exposure to new things. Upon our arrival at the Lodge the students and I were met by Pebble and Rodger, silent members of the CSAG team. Pebble is family to Prof. Bruce Hewitson and wife Nancy, a dog that brings happiness and an unusual amount of energy for his age. Nancy added her motherly touch and a homely feeling through the provision of food. Rodger is an employer of CSAG who works remotely as the systems administrator for CSAG and is actually a neighbour to the Mount Grace Lodge. 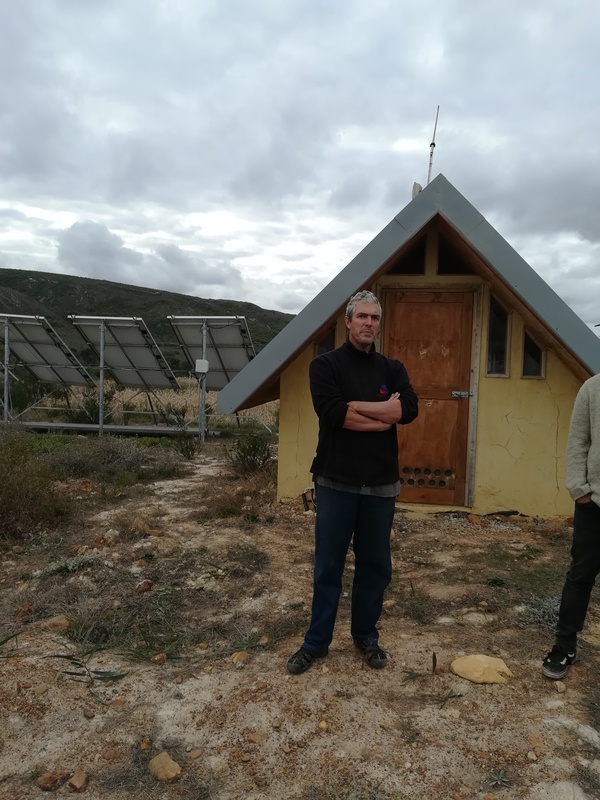 Rodger and his family provided insight and answered questions about sustainable living along with some insight to stimulate thought on the scale implication of resource management politics. Dr. Piotr Wolski added to the overall experience by bringing along his slacklining equipment. A challenging but fun exercise. The CSAGers are by far the most interesting group of intellectuals I have been fortunate to work with. When we arrived at the lodge Bruce and Rodger briefed us on expectations for the weekend. One of the first tasks was to form two groups and agree on shifts for collecting site specific data. The idea was to collect data over a 24 hour period at 4 hour intervals, at four different sites. This translates into each group going out into the field every 8 hours with a total of three shifts for each group. Additionally, weather balloons would be released periodically during the 24 hours. Before collecting data at the various sites we were to setup a temporary weather station which taught us what to consider when identifying a suitable location for a weather station. After setting up at base camp, it was finally time to release a weather balloon into the atmosphere. 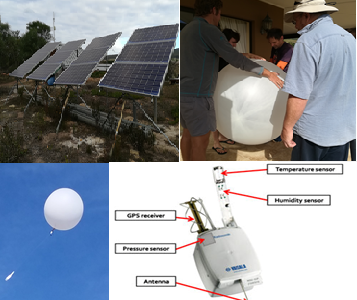 The weather balloon would be used to carry aloft a radiosonde – a battery powered telemetry instrument package that measures atmospheric parameters and transmits this data by radio to a ground receiver. The computer software displays this data as graphs of real time change in atmospheric parameters and tells a story about atmospheric characteristics relative to changes in altitude, a story best told by the CSAG professionals of course. Bruce took us to identify and familiarise ourselves with the sites for the shift work. This would serve as the first shift and we all learned how to use the instruments for data collection. 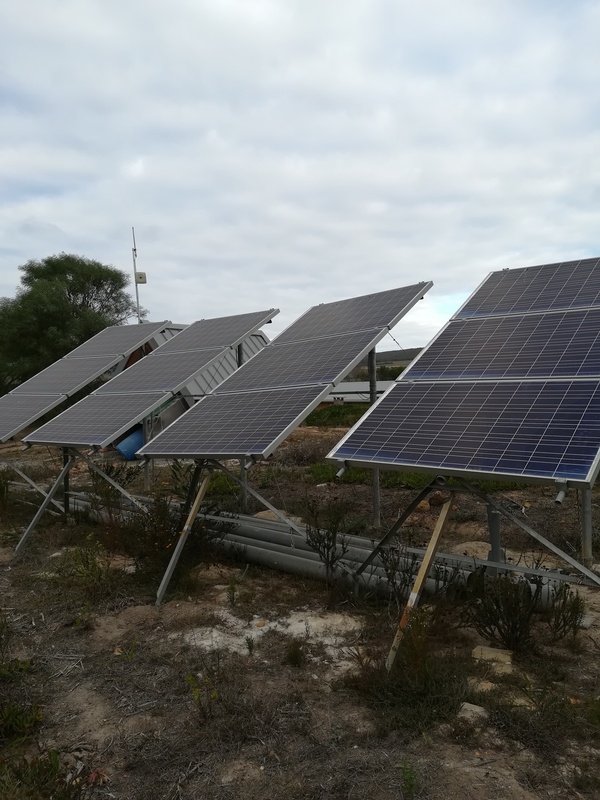 The instruments used included a kestrel meter, spinning hygrometer, radiometer and digital multimeter which allowed us to collect dry bulb and wet bulb temperatures, wind speed and direction, humidity, radiation and pressure measurements. We actually estimated wind direction by physically trying to feel the wind and where it’s coming from. At night (or the early hours of the morning) there was almost no wind making it difficult to estimate wind direction. Don’t be fooled though, with the wind seemingly absent the cold was still almost unbearable. Nonetheless, the darkness came with its own beauties. The sky could not go unnoticed, filled with clusters of stars and shooting stars (possible satellites observed in orbit). The sound of a flock of birds hidden in the dark between the reeds chirping harmoniously and the image of a rabbit racing in front of the vehicle as if it were guiding us but, in the contrary just trying to evade danger. These were a few things which made this trip memorable, not forgetting the odd bat. Rodger and his family are homesteading. They gave us a tour of their place of residence. Their main supply of good quality fresh water relies on rainwater harvesting. They also have access to stream flows and groundwater. They make use of a bio-digester, solar panels and fire as energy sources. Their home is crafted using clay, straw, wood and smaller proportions of cement. The end result is a modern looking home (double-storey) with great insulation and low maintenance. Of course farming is practiced to sustain themselves. Sustainable living is a good way of saving money, reducing strain on resource supply systems and increasing property value. The key to living a sustainable lifestyle is appreciating what you don’t have, making good use of what you do have, consume responsibly and generate less waste (particularly plastic). The end result is happiness. 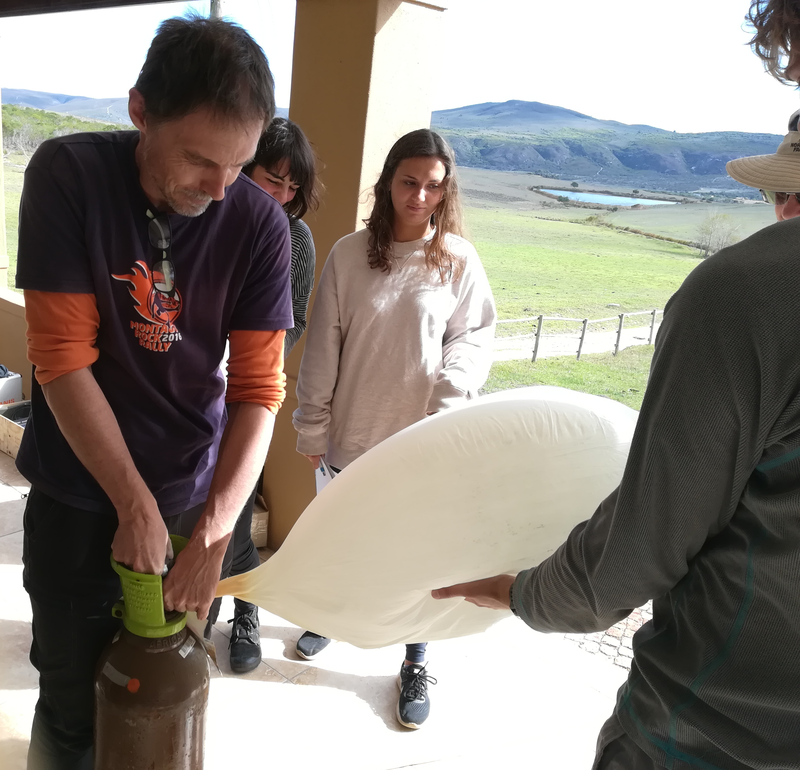 Our last day on the field trip: We would finish midday with collecting the site specific data, release the last weather balloon and work together to do a manual balloon tracking exercise. This relies on using a theodolites to track smaller (50g) red balloons released into the atmosphere. It requires good teamwork, communication and hand-eye coordination skills. It’s a process of tracking the movement of a balloon in the atmosphere and capturing the altitude, azimuth and time each time the balloon is observed in the crosshair of the theodolite. It was cloudy at the time so we were lucky if we were able to track the balloon for longer than 5 minutes. At the end of a long two days everyone was keen on having a nice warm shower and good rest in the comfort of our own beds. The memories will be everlasting. Friendships were made and others strengthened. Knowledge was gained and lessons learnt. 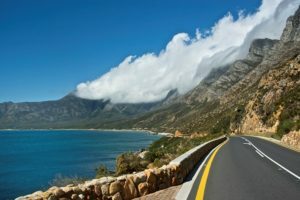 And the trip ended with a scenic drive along the coastline of Gordons Bay and into the sun set. Memorable and magical!